Tenzin describes Labrang as a “modern Tibetan city.” By that he meant the Chinese influence here is not so apparent. Between my hotel and the monastery, no more than 400 meters away, there is a row of shops lining both sides of the main road. I wouldn’t say they are all Tibetan-owned, but the majority are. They are selling jewelry and religious objects, with a few small convenience stores, restaurants, small hotels, clothing stores, including a few selling monk’s apparel, thrown in. 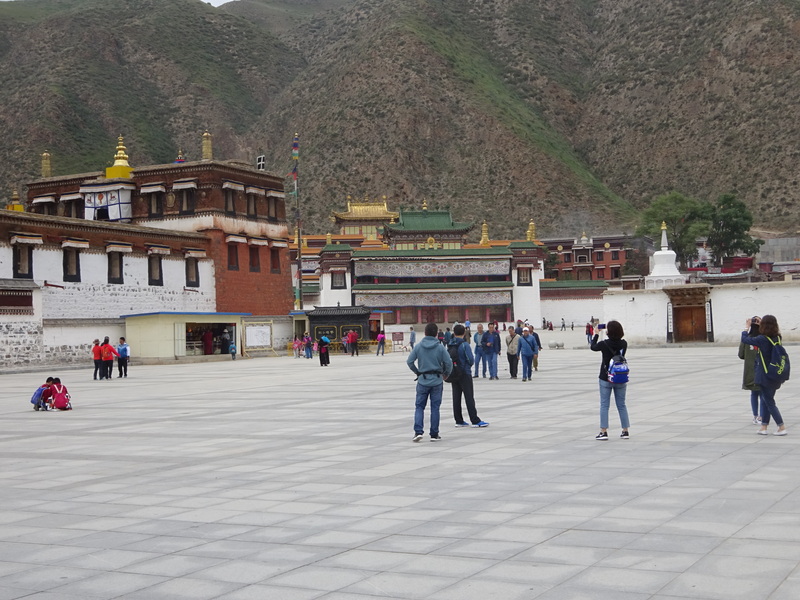 The main entry square to Labrang–doesn’t begin to convey the size. This is the tourist part of town, close to the monastery, where traffic includes pilgrims from all over Tibet, China and the world. For several days here, though, I saw no westerners, and very few even now. We encountered another tour group with my agency in Repkong, 8-9 Russians on a 21-day tour. 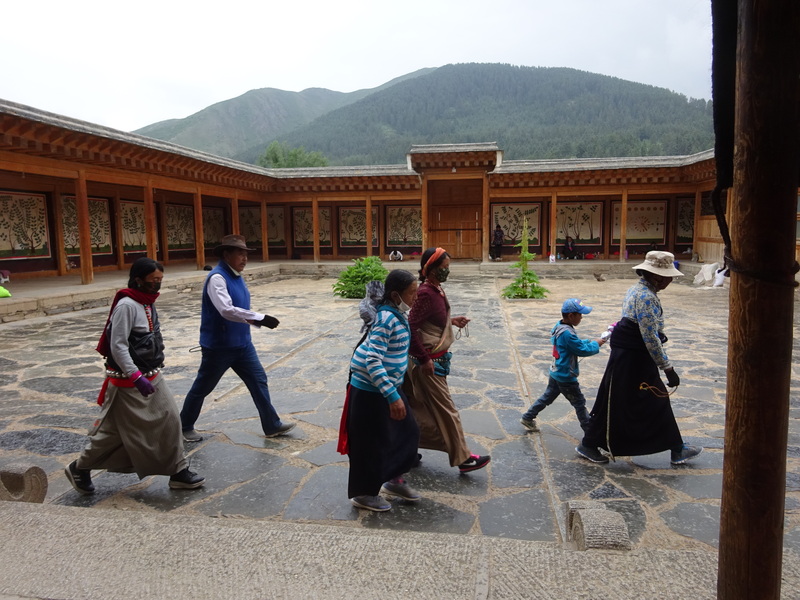 Here in Labrang, other than a Canadian mother and daughter who joined my tour of the monastery yesterday, I have seen perhaps three westerners. Amdo is off the tourist track apparently–at least at this time of year. 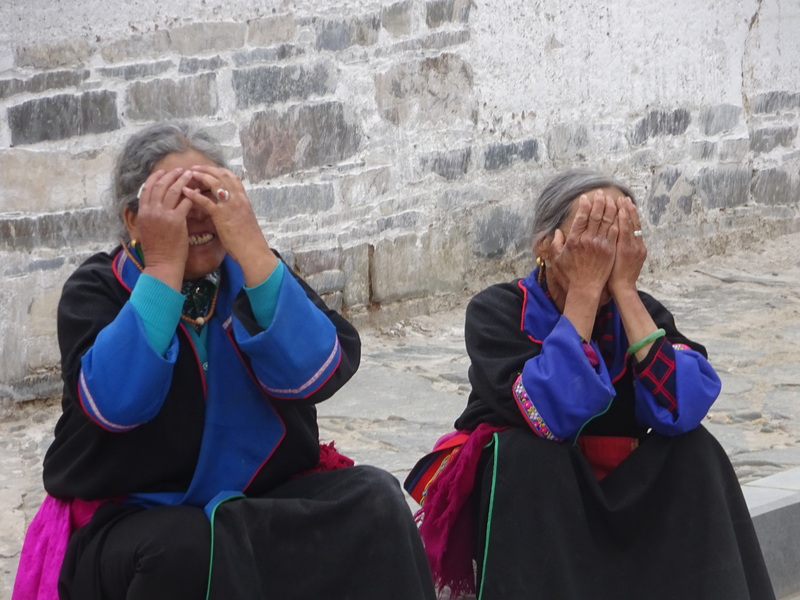 Lhasa is the attraction of Tibet. 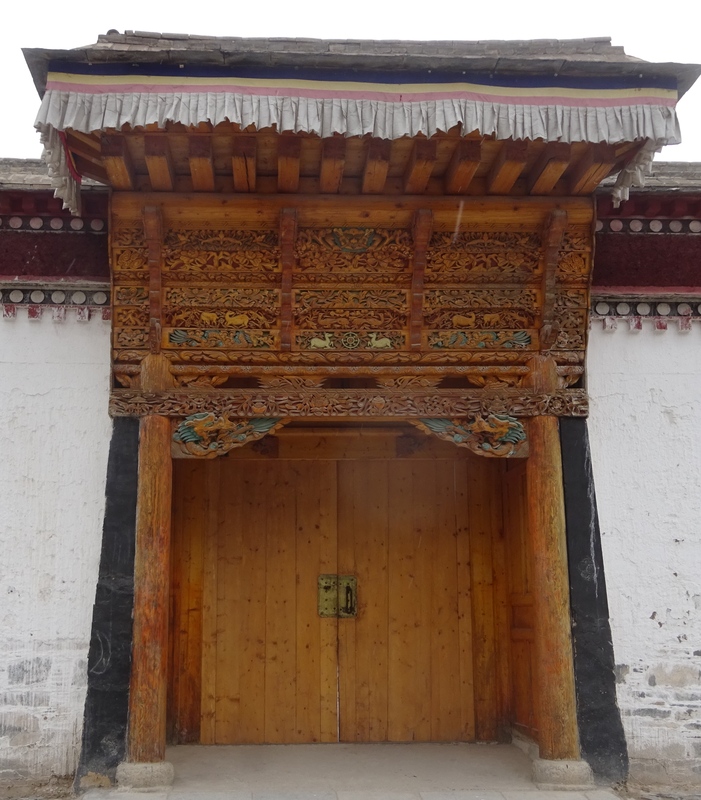 The tour of Labrang included a few of the different monastic colleges (such as medicine, philosophy, tantra), each with their own assembly hall, and about 8 of the 21 temples. I have become accustomed now to some of the statuary, and can identify more of the figures, statues and paintings of protectors, the guardians, commonly found on the tangkas that hang in nearly every temple. The monk guiding us is maybe 30 years old, spent 9 years in a monastery in South India before coming to Labrang 4 years ago. He is studying English, but speaks in a strong accent that is sometimes difficult to understand. Along our way I asked him what happened here during the Cultural Revolution. He declined to say, whispering that the Chinese would not be pleased to have this discussed. We see temples dedicated to Maitreya, Tsongkapa (flanked as always by his primary disciples), Manjushri, Shakyamuni, small stupas containing relics of the first abbott here as well as the second and third, etc. 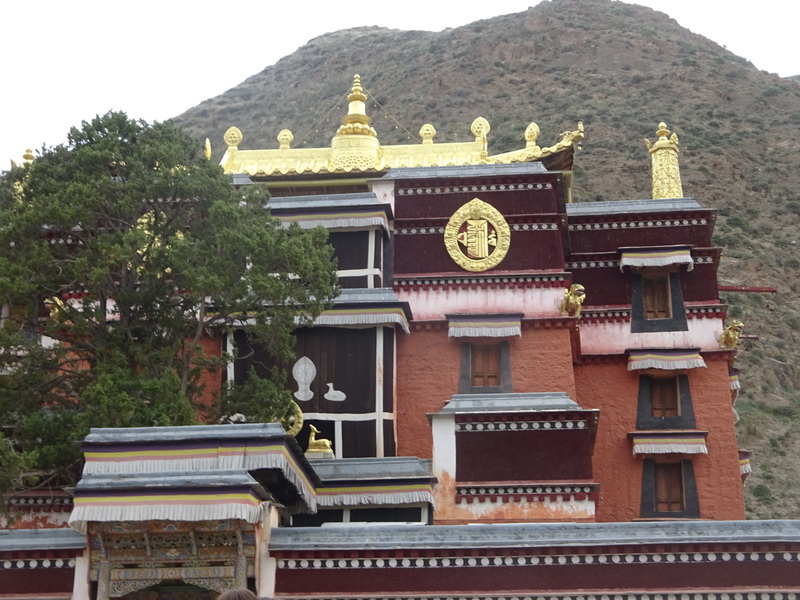 There is a small stupa containing relics of the main teacher of the IVth Dalai Lama. I made an offering there. When Tibetans do korra, they waste no time. They all pass me like I’m standing still. It’s hard to overstate the importance of Tsongkapa to this region in particular and to all of Tibetan Buddhism in general. 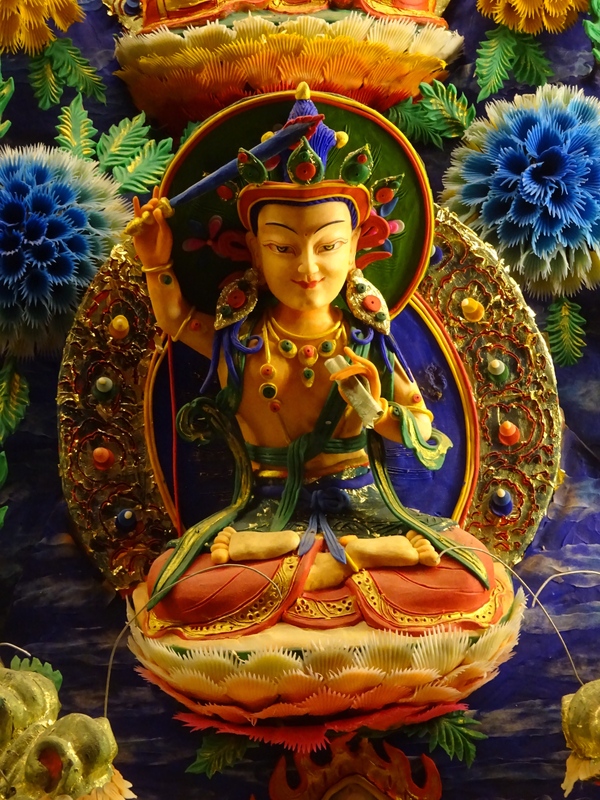 He is a founding and guiding presence in virtually all of the monasteries in eastern Tibet. His great accomplishment, aside from his own awakening, was to flood himself in his younger years with teachers of all different threads of practice and to eventually synthesize it all into three volumes, his most famous work, the Lamrim Chenmo, Stages of the Path to Enlightenment. This is a work that has undergone no substantial revision in 700 years. 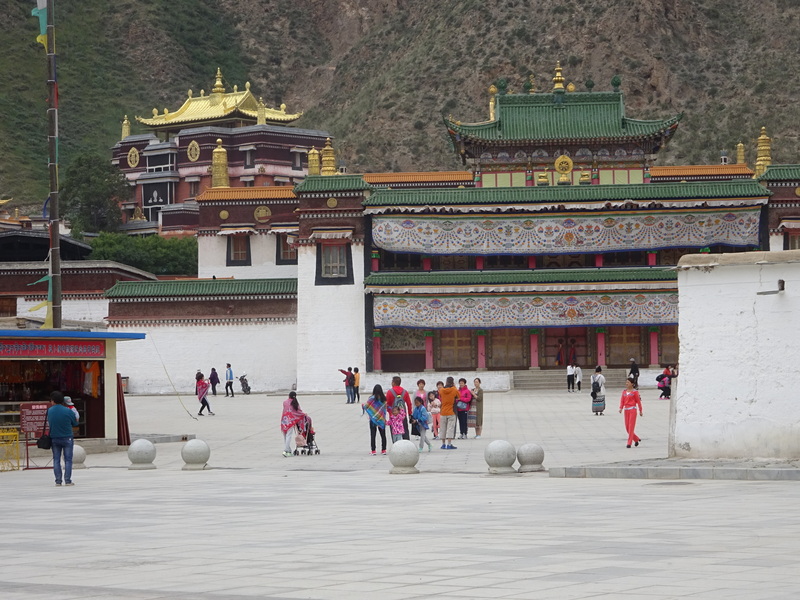 There is construction all over Labrang Monastery, improvements of walkways, roads, stairways, patios. I once asked how so many monasteries are financed. The (partial) answer, of course, is that local people have always contributed to the life of these institutions, large and small. But I suspect, despite having no solid evidence to support this idea, that many of the larger monasteries have what we would consider endowments, possibly accumulated over centuries, perhaps even established and enlarged by substantial contributions of gold from Chinese royalty. This is how Tibet came to be known as the “western storehouse” by the Chinese. Such contributions may have been used to buy land, from which rents have been collected for centuries, and which form the basis of what the Maoists considered to be a feudal system that must be dismantled. 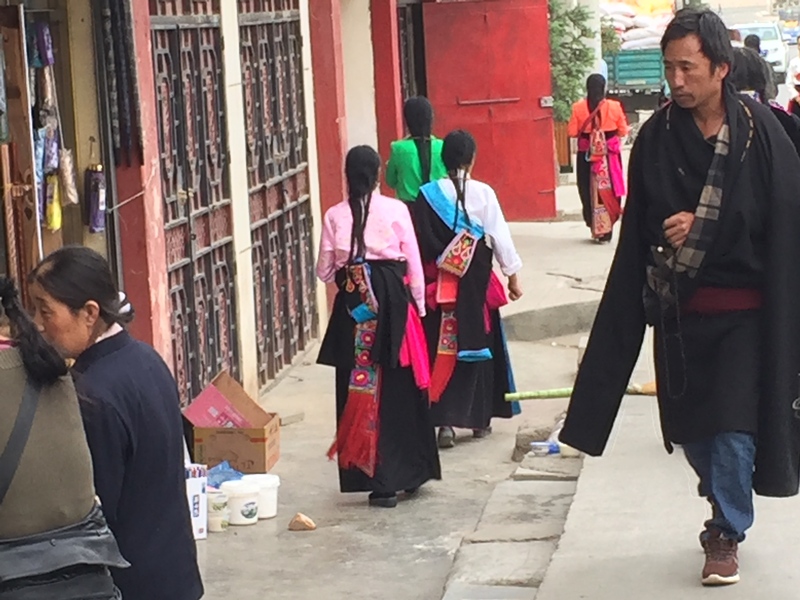 Walking the streets of Labrang is also an education of a different sort. Everywhere one looks, there are people going about their business with a mala in one hand, reciting mantra; a young mother with a small child strapped to her back, older women and men are most likely to be doing the same. I saw a young woman performing prostrations on her personal mat outside her small shop as she opened up for the day. Young people are wearing malas. Monks quarters are private room build around a courtyard. Some of the doors are striking. It might be easy to dismiss such manifestations as “Buddhist chic”; I suspect this is not the case-not here. This is a culture that has taken millennia to evolve from warriors to spiritual warriors. And along the way they have accumulated a body of knowledge that, to my mind, is unsurpassed. So when one sees the average person here persisting in focusing the mind regardless of whatever else they may be doing, one is seeing an expression of centuries of practice. 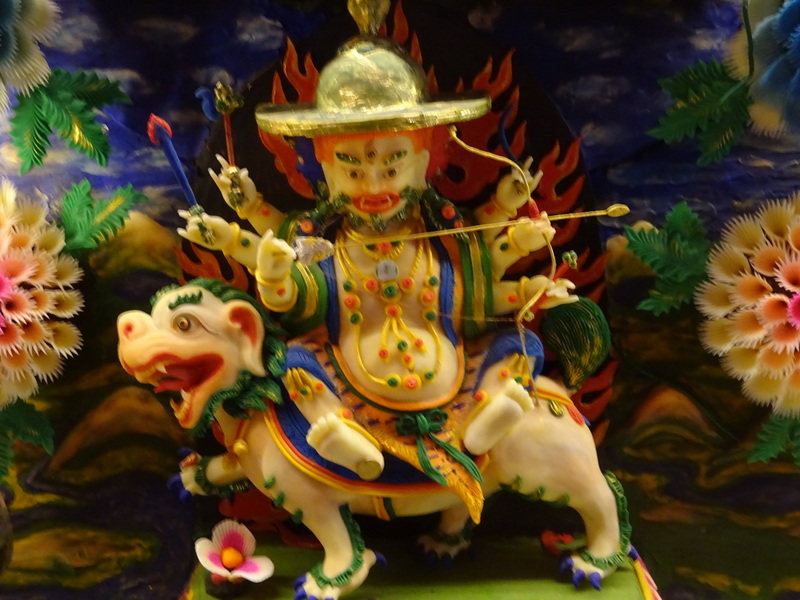 This entry was posted in Buddhism, Personal, Tibet, Travel by garyhorvitz. Bookmark the permalink.